Need to buy non-GMO soybeans? On March 3, we will be hosting a forward auction for 10,000 bushels of 2014 crop year, feed-grade, non-GMO soybeans. Bids are FOB Maryland. Have organic soybeans to sell? On March 5, we will be hosting a reverse auction for 10,000 bushels of feed-grade, organic soybeans delivered to northern Indiana. Delivery is to be complete by April 30, 2014. These are both great opportunities to connect with quality operations looking for new supplier/buyer relationships via our easy-to-use platform. Please contact Cinch Munson, Director of Market Operations, for more information and to register to participate, by email or by phone at (308) 530-9443. Our first-ever Annual Market Report provides a summary of price and trade data collected during 2013 on non-GMO corn, non-GMO soybeans, organic corn, organic soybeans and organic wheat. We make our price and trade reports available on an ongoing basis to our subscribers throughout the year; however, our Annual Market Report is a broad stroke review of the entire year of data and provides additional analysis for several data points not yet available on our website. Overall, organic feed corn showed a marked decrease over the full year, with much of the Midwest corn-growing region recovered/recovering from severe drought experienced in 2012. 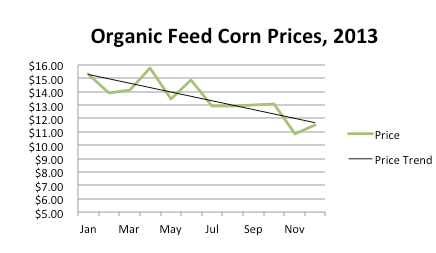 From a volume-weighted January price of $15.29/bushel to a December price of $11.50/bushel, organic feed corn finished the year nearly 25% lower than it began. Are you interested in knowing which countries were the top exporters of organic corn, wheat, and soybeans to the U.S. last year? The average prices for non-GMO corn and soybeans? The 2013 average price for organic hard red winter wheat? Our Annual Market Report is now available to our Silver Level and above subscribers, or by request for $150. For subscription information, click here.